The cheapest option for fall grazing is crop residue, specifically corn residue. Corn residue can be an excellent grazable feed for about sixty days after the combine leaves the field. Fence and water are usually the biggest challenge to utilizing this feed resource. The variety of temporary fence and water options available can overcome that challenge. Grazing corn residue in fall can also take pressure off of your pasture fields and allow you to stockpile more forage for winter grazing. Check out the Factsheet “Grazing Corn Residue”,for more information. Stockpiling tall fescue is a relatively inexpensive option and can be done with existing pastures. To start stockpiling, make the last clip or grazing anytime from the end of July through September. Generally, the earlier start the more you will have, but the lower the quality. The opposite is also true: the later you start, the higher the quality, but lower yield. After the last cut/graze add 50 pounds of nitrogen per acre. The addition of the nitrogen will add from 1000-2000 pounds of forage. If you have a large amount of clover, over 40%, then research shows little additional response to N applications for stockpiling. After applying the nitrogen then delay grazing those fields until November through February. Quality will start to decline after Thanksgiving, but it is a slow decline. Usually the quality of stockpiled tall fescue will be still good enough for a ewe in good condition into February. Orchardgrass can also be stockpiled. Research conducted at OARDC Jackson Branch showed that orchardgrass will have protein around 12% into February. Orchardgrass will weather rapidly after prolonged cold temperatures, so yields will be reduced the longer you wait to graze. 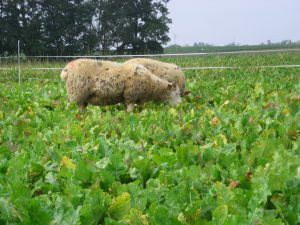 Brassicas are also options to extend the grazing season. Turnips are the most common brassica used in Ohio. Turnips can be planted from mid July through early August. Most cultivars will reach maximum yield in 90 days. To get a good crop of turnips, you need two pounds of seed and fifty pounds of nitrogen per acre. Either no-till or conventional seeding will work. The hardest part is the low seeding rate and a small seed. Mixing the seed with the fertilizer helps. Tops and bulbs can both be grazed, with the tops being the higher quality feed component. Brassicas are very low in fiber, feed low quality hay to help slow its passage through your livestock. The crop should remain available to livestock until temperatures fall below 15 degrees. Check out the Factsheet “Brassicas for Forage”, for more information. Winter rye is an option that can produce a high quality crop for grazing in December and March. It is very high in quality and will be the first to green up in the spring. This is a good option for livestock with high nutritional needs. For early spring grazing do not over-graze rye in December. Winter rye can be planted from the middle of August through the middle of September at 90-100 pounds of seed per acre. When rye is 2-4 inches tall, 50-75 pounds of nitrogen will stimulate growth and additional applications in early March will increase production. Check out the Factsheet “Winter Rye for Extending the Grazing Season”, for more information. Spring oats planted from July through September will grow more feed in the fall than winter rye but won’t have the spring growth. Optimum planting is the first week of August and you can grow an average of 6,000 pounds of dry matter per acre. Plant bin run oats originating in Canada at a rate of 80 to 100 pounds per acre. Fifty pounds of nitrogen will be beneficial. Like stockpiling tall fescue earlier planting will increase yield but quality will be lower than a later planting. Standing corn can also be a viable option for winter grazing. Yes, in Ohio most people would consider this crazy. The profile of the plant and the fact that a lot of its nutritional quality will be in the grain make it an attractive option. It will be less likely to be ungrazable because of excessive snow and or ice. 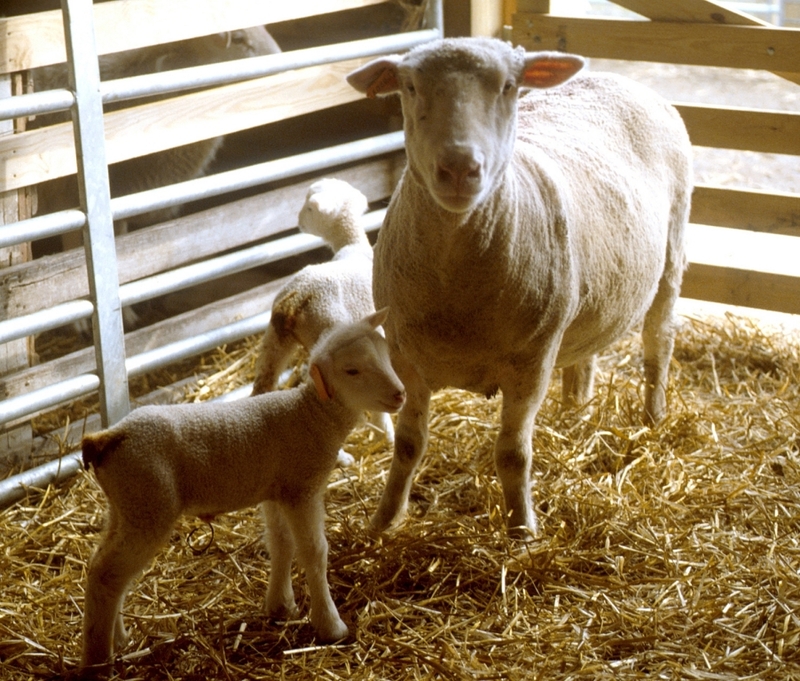 Of course you will need to get your ewes started on grain before grazing this crop. Research at OARDC has shown an acre of standing corn can feed 20 ewes for 70 days. Check out the Factsheet “Using Corn for Livestock Grazing”, for more information. For all of these forages the grazing management needs to include strip grazing. Strip grazing or limiting access with temporary fencing will increase utilization of the crop and decrease the amount wasted. Posted by Braden Campbell at 8:00am January 4, 2019 Posted in Forages and Pasture and tagged Forages and Pasture, Management, Nutrition. Bookmark the permalink.